Baristador Coffee is a service to espresso aficionados so I’m sure you’ll feel a chill down your spine when I say the words, dredgdrawer full. For those of you who only use manual methods for espresso making, this warning message is one that appears on automatic machines when the spent grounds have filled the machine’s holding area and needs emptying. Are there worse things, like Beans Empty? While I admit there are other warning messages like ‘beans empty’, they pale to insignificance if you’re going to respond to dredgdrawer full properly. For example, beans empty can sit at either end of the fear spectrum. It can either be easily fixed by topping up the machine with beans or can be an horrific nightmare if you’d forgotten to place your coffee order (hint: order coffee now). But dredgdrawer full demands more attention. While it’s true you can just open your machine, empty the grounds container and start making coffee again, a true lover of espresso will no they are short-changing themselves. The dredgdrawer full message is a useful time to brush out the machine, was the inner workings and keep things fresh. I use my automatic machine in manual mode – I freshly grind B70 blend coffee and spoon it into the machine per cup. In my experiments, there has definitely been improved brightness and sweetness in flavour by keeping the machine clean and washing away deposits of oil and stale grounds that can build up in the inner recesses. 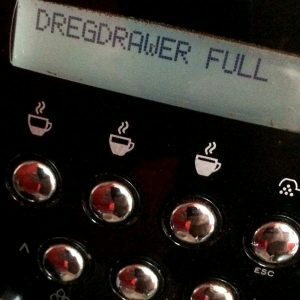 So, to make sure your coffee drinking has a happy ending, I suggest using the dredgedrawer full message as a reminder for a good cleaning out of the pipes!